Monterey Regional Airport (MRY) is about three miles southeast of Monterey. If you fly up from the south you can enjoy a scenic flight up along the coast past lovely deserted beaches and dramatic coastal cliffs. The Monterey Bay Aquarium, the world’s sixth largest, is perfectly positioned to lead worldwide research into nearshore habitats and deep sea life. You may not be able to see it from the shore, but Monterey Bay is an incredibly diverse and unique ocean habitat, due to the Monterey Bay Submarine Canyon, which extends 95 miles into the Pacific Ocean and reaches depths of 11,800 feet. Strange fish and invertebrates live at these great depths. Meanwhile, cold-water upwelling brings large quantities of zooplankton and other nutrients to the surface, where a giant kelp forest shelters abundant marine life. After decades of protection, the bay and estuaries are teeming with life, and you can experience it up close. Initially funded by David Packard of Hewlett-Packard, the Monterey Bay Aquarium has been operated by his daughter and esteemed marine biologist, Julie Packard, since its opening in 1984. Through innovative displays and hands-on exhibits, she has worked tirelessly to turn it into the world-class aquarium, research institution and jewel of the California coast it is today. From the million-gallon Outer Bay tank to a myriad of jellies, seahorses, seabirds, and deep sea creatures to the 3-story kelp tank teeming with families of playful otters, it’s always a perfect way to spend the day. Tickets for the aquarium are $40 for adults, $25 for children, and $35 for seniors and students. The Monterey Bay Aquarium is open daily from 10 AM – 5 PM. More details can be found on the official website for the aquarium, or by calling 831-648-4800. When flying to Monterey, you definitely won’t want to miss visiting this one of a kind aquarium. Monterey Regional Airport (MRY) is about three miles southeast of Monterey. If you’re flying to Monterey from the south you can enjoy a scenic flight up along the coast past lovely deserted beaches and dramatic coastal cliffs. But along the coast flying to Monterey from either direction, pilots are requested to remain at or above 2,000 feet AGL over several wildlife refuges. Note that flight below 1,000 feet AGL over the Monterey Bay National Marine Sanctuary, depicted on the sectional chart, violates NOAA regulations (see 15 CFR 922) and could result in civil fines up to $100,000. The entire California coast is prone to fog, especially in spring and summer. Over the Monterey Bay, prevailing northwest breezes tend to push fog away from the Santa Cruz area and toward Monterey. Monterey offers several instrument approaches, including an ILS, but if conditions prevent landing at Monterey, Watsonville Municipal Airport (WVI) is 21 nm north, slightly inland, and can be used as an alternate. Salinas Municipal Airport (SNS), 12 nm northeast, is also often clear when Monterey is not. At Monterey Airport, the FBOs each have five courtesy cars available for 3–4 hours on a first-come, first-serve basis. Or, they can call you a taxi. For call-ahead service, contact Central Coast Taxi at 831-626-3333. The typical fare to town is around $21. Once downtown (during the summer), you can catch the WAVE (Waterfront Area Visitor Express), a free trolley that operates between Fisherman’s Wharf, Cannery Row, and the Monterey Bay Aquarium. Look for the green MST Trolley signs to board. It runs daily Memorial Day through Labor Day, weekdays between 10 AM – 7 PM, and weekends and holidays between 10 AM – 8PM. For those interested in maximum flexibility and in visiting Santa Cruz and Elkhorn Slough (more on that in a bit), go for a rental car. Companies include Avis (800-352-7900), Enterprise (800-736-8222), and Hertz (800-654-3131). 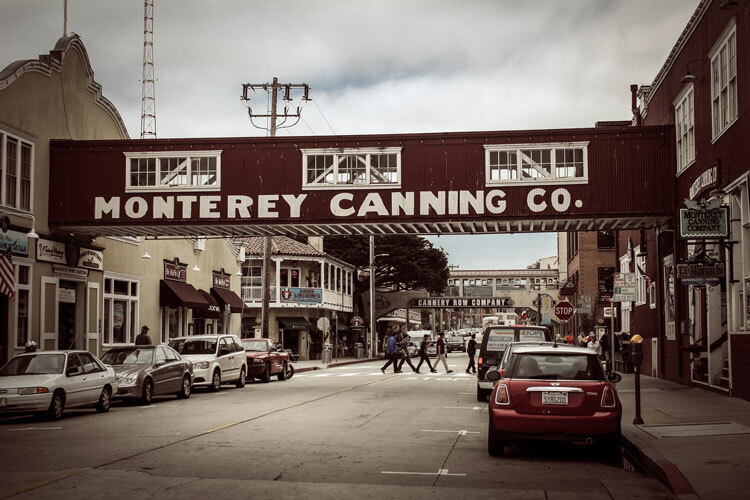 Once known as the sardine canning capital of the world, Monterey’s Cannery Row processed 250,000 tons of sardines per year until the sardine population collapsed due to overfishing. Monterey languished without a steady or substantial income until being reborn as a tourist destination in the mid-1980’s when the Monterey Bay Aquarium opened its doors, and shops and restaurants blossomed all around it on the sea shore. Just a few minutes stroll from the Aquarium, the scenic Fisherman’s Wharf offers an abundance of dining and shopping, all with quaint, vintage seaside appeal. Cannery Row, Monterey’s main strip, made famous in the 1945 novel by John Steinbeck of the same name, is loaded with hotels, inns, restaurants, shopping, and tourist attractions. You can walk along the bustling streets beside trolleys offering tours and transportation, or get an elevated view of the excitement by meandering through the covered bridges overhead that act as shortcuts from buildings on one side of the street to the other. Lining the old concrete roads are doorways to any water-based adventure you could hope for. For adventurers either intrepid or tentative, Breakwater Cove is an excellent spot for scuba diving when armed with PADI certified dive courses from Glenn’s II Aquarius Dive Shop. You can check out their flexible class schedule on their website. If you’d prefer to stay on top of the water, try the 2 1/2- to 3-hour whale watching and nature tours operated by Princess Monterey Whale Watching, where experienced marine biologists narrate the exciting and informative tours. Tickets are $40–$45, and you can call them at 831-372-2203 or 888-223-9153, or get more details on their website. Specialty tours include the shorter, 30-minute tour around Monterey Bay aboard the Little Mermaid glass bottom boat. 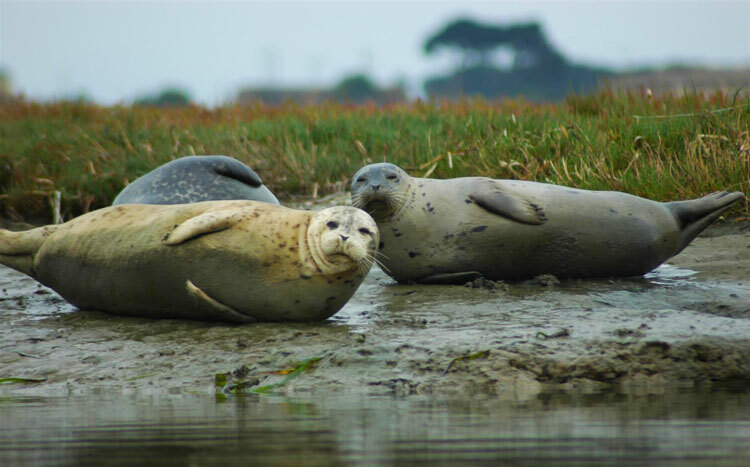 This tour highlights points of interest in the bay and features an educative introduction to the Monterey Bay’s Marine Sanctuary. Whereas some tours are available nearly any time, the affordable Little Mermaid glass bottom boat tour is available weekends only from 11:30 AM –5:30 PM, so plan ahead! Tickets for adults are $14, children are $12, call 831-372-7151 for more information. A mere twenty minutes away from the idyllic rocky beaches of Monterey lies a dramatic scenery change: from a light ocean breeze and the wistful cries of terns and seagulls to the hot whip of wind and smell of burning rubber as the fastest vehicles around race by. Motor racing fans know that the Mazda Raceway Laguna Seca is one of the most challenging road tracks in the world. A smooth surface, low grip, and major elevation changes provide serious challenges to the finest drivers, but the infamous Corkscrew is simply one-of-a-kind. As cars reach the apex of a long hill, they must negotiate a turn they cannot see, while breaking, losing grip on the front end, and then suddenly dropping three stories as the track falls away, twisting all the while. Throughout the year, you might see the Monterey Grand Prix, Ferrari Racing Days, Superbike World Championships, or the MotoGP motorcycle races. If you go to a race, give yourself an hour before the flag flies to meander through the paddock, past the trailers, and meet the drivers for autographs and close-up pictures of the cars. Then, head across the track bridge to the grandstands near the start line—the exhilaration is palpable when all those powerful engines fire up at once. After the race begins, you can cross the bridge again and begin walking along the track to see the various turns, eventually heading up the hill to the Corkscrew, which is a great place for fans to watch the cars as they negotiate this crazy turn. If you simply can’t imagine how the drivers do it, take the opportunity to get to know the track yourself on one of the monthly twilight bicycle rides. Or, better yet, why not get behind the wheel for a real taste of pure adrenaline? 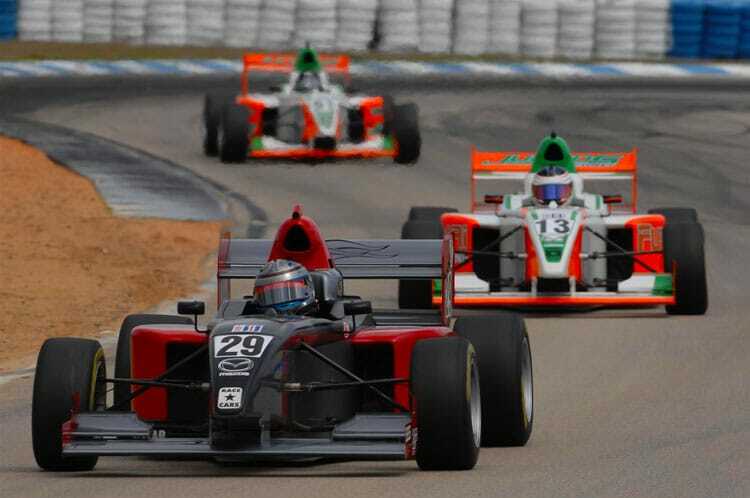 Skip Barber Racing School, which operates at Laguna Seca, offers an array of programs to whet your appetite for danger, including MazdaSpeed racing school and the high-performance driving school, with one, two, or three-day programs. For more information on the races and twilight bike rides, you can call (831-242-8201) or visit the Mazda Raceway website. For more information on getting in the driver’s seat, call (866-932-1949) or visit the Skip Barber website. Schooners Coastal Kitchen, a local favorite on the first floor of Cannery Row’s Monterey Plaza Hotel & Spa, combines fresh sustainable food, a relaxed atmosphere, and ocean views. Schooner’s “Locally Overboard: Farm to Fork, Sea to Table” program tempts guests with fresh fish caught off the California coast along with local produce and meats. They’re open from 6:30 AM – 11 PM, and you can call them (831-372-2628) or visit their website for more information and a menu. Another sure-fire choice for fantastic food is First Awakenings, which is ideal for breakfast. The family-friendly restaurant offers both traditional breakfast fare and a few with new flair, like their All that Razz Pancakes with raspberries, coconut, and granola. First Awakenings was voted “Best Breakfast” in the Best of Monterey County six years running. They’re open on weekdays from 7 AM – 2 PM, and on weekends from 7 AM –2:30 PM, and you can call them (831-372-1125) or visit their website for more information. For a quick bite after flying in, visit Tarpy’s Roadhouse, less than two miles east of the airport on Salinas Highway. This is fine dining American, country style. Choose from fresh meats and fish prepared on a wood-burning grill, sandwiches, prime rib, an extensive wine list and a full bar. Enjoy the cool air outside on a sunny day while you gaze at the lush gardens. Lunch is served daily from 11:30 AM, dinner from 4 PM, Sunday brunch from 11:30 AM – 3 PM. You can call them (831-655-2999) or visit their website for more information. If you’d like to stay right on Monterey’s waterfront near Fisherman’s Wharf, the Portola Hotel & Spa is for you. It’s Monterey’s only AAA four-diamond, silver LEED-certified hotel. Many of its 379 rooms have ocean views and private patios. Indulge yourself at the Spa on the Plaza, repeatedly voted the best spa in Monterey. For a taste of the good life, don’t miss staying here. For more information, you can call (831-649-4511 or 888-222-5851) or visit their website. One of Monterey’s newest hotels, Hotel Abrego offers 93 luxurious rooms outfitted with Italian linens, spa-like bathrooms, refrigerators, and free WiFi. In addition to a heated outdoor pool and hot tub, the hotel has many rooms with cozy fireplaces that are perfect for a romantic getaway. Its location in the heart of downtown provides easy access to many local attractions and restaurants. The on-site bar at Hotel Abrego has breakfast, dinner, and bar menus. For more information, call them (831-372-7551 or 800-982-1986) or visit their website. The magic of Monterey extends in all directions. Right next door is Pacific Grove, where you can wander along beautiful and less crowded beaches, many with tide pools and dramatic rocks to scamper over. If you simply can’t bear the thought of leaving, look to the exquisite old homes across the street from the beaches, two of which have been turned into highly praised B&Bs that are booked out months in advance (the Green Gables Inn and Seven Gables Inn). Stop by and tour the Point Pinos Lighthouse, the oldest continuously operating lighthouse on the West Coast built in 1855, for only $2 for adults and $1 for children 7 and older. The lighthouse is open from Thursday to Monday from 1 – 4 PM, and for more information, you can call (831-648-3176) or visit their website. Just to the south, the world-famous 17-Mile Drive at Pebble Beach loops around stunning beaches and dives through dense forests, interspersed with fabulous mansions and passing by the legendary Pebble Beach golf courses. Pebble Beach features four par-72 golf courses and a nine-hole course. Spend the evening at the Inn at Spanish Bay, where you can sit on the terrace at sunset, sip a local wine, and listen to the Scottish bagpiper “put the golf course to sleep.” The three luxury hotels let guests stay close to the green: the Lodge at Pebble Beach, the Inn at Spanish Bay, and Casa Palmero at Pebble Beach. For golf rates and hotel reservations, call 800-877-0597. An extensive list that includes more luxury and affordable hotels, restaurants, golf courses, fitness centers and shops in Pebble Beach, with local phone numbers, is available at the Pebble Beach website. At the end of the 17-Mile Drive, you’ll reach luxurious Carmel-by-the-Sea, home to both Clint Eastwood and pristine white sand beaches. Carmel is home to haute couture boutiques, touristy shops, art galleries, vegan eateries, and a bevy of white table cloth restaurants. For more information on Carmel, you can visit their website. Those with the adventure bug should throw on some quick-drying clothes and get up close and personal with amazing ocean animals such as the locally famous otters and sea lions. Kayak along Elkhorn Slough, one of California’s largest wetlands, near Moss Landing, about a 21 miles north of the Monterey Airport. Reserve a one- or two-person kayak with Kayak Connections and take a tour, or take the reins (or paddle) in your own hands, and plot the course for your own adventure! There’s enough space for a backpack inside the kayak, and with binoculars and a little bit of patience, you can count the whiskers on a sunbathing otters face. I floated in one spot for half an hour while an otter dove repeatedly, each time coming up just a few feet away with a new morsel to be loudly munched. About 100 otters inhabit Elkhorn Slough, tumbling and playing when they’re not devouring crabs, clams, and other shellfish. Sea lions and harbor seals also live here, and you’ll find them resting on shore, along with pelicans, cormorants, and hundreds of black-hatted terns chirruping from all sides. The water is calm, so it’s an ideal place for a beginner, but if you’re bringing along children or are a novice kayaker, mornings tend to have less of a breeze. You’ll probably stay dry except for a few drips as the kayaks are closed with a skirt, but as mentioned, wear synthetics that dry quickly, breathe, and keep you warm without overheating. Hang your camera around your neck, stuff it in your life vest to keep it dry, and you’re good to go. Allow yourself about 4 hours to explore the beauty of the natural landscape. You can find out more by calling (831-724-5692) or visiting the Kayak Connection website. If you got hungry while kayaking, head over to Phil’s Fish Market and Eatery, just south of Elkhorn Slough, to satisfy your seafood cravings. The Food Network’s Bobby Flay loves this place, and why not? You can’t get any fresher—the harbor is right there. Eat in the bright, spacious high-ceilinged dining room, or out on the heated patio. Enjoy live music on Monday, Wednesday, and Thursday nights. Savor champagne-sautéed oysters, Dungeness crab, or the ever-popular Rock Shrimp and Bay Scallops in Basil Sauce, or order the freshest, most zingy cioppino you will ever have. The fire-roasted artichokes are picked across the street, and make an excellent appetizer for what will be an unforgettable meal. Entrees run from $14–$28, and Phil’s is open Sunday – Thursday 10 AM – 8 PM, Fri & Sat 10 AM – 9 PM. For more information, call (831-633-2152) or visit their website. If you head north past Elkhorn Slough, you’ll soon come to Watsonville. If you’d like to go skydiving, you’re in luck. Skydive Surfcity is right on the field just west of transient parking. The staff members specialize in tandem dives with first-timers, and you can get a video of the entire experience, including free-fall, which lasts about 60 seconds. At about 5,000 MSL, the parachute is opened and you have about five minutes to practice steering and enjoy the peaceful sunset view before landing on the beach below. This is available to adults 18+ only, and 10,000-ft jumps are $159–$199, 12,500 – 14,000-ft jumps are $199–$229, and recording a video is $79. For more information, you can call (831-435-5169) or visit their website. Skydiving isn’t the only aerial adventure accessible to visitors! 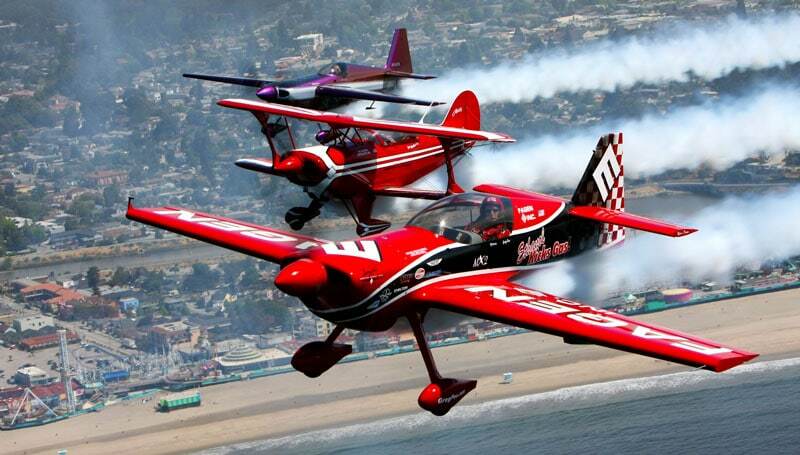 The Wings Over Watsonville fly-in and airshow is Saturday, September 3rd, 2015, 8 AM –6 PM. Stop by for aerial demonstrations, historic and antique aircraft, food vendors and more, all with free admission. Check out their website for more information. Head past Watsonville and into Santa Cruz, where the Santa Cruz Beach Boardwalk is a half-mile of old-time fun along Main Beach, with over 34 rides and attractions, including the 1911 Looff Carousel and the 1924 Giant Dipper roller coaster. There are plenty of other thrill rides as well as restaurants, shops, games, an indoor arcade, a laser tag arena, bowling, and even miniature golf. The wonderful thing about this place is that you can always come here for free and enjoy the atmosphere, even when the rides are closed. Pay only for rides you want to try or get an unlimited rides wristband. For more special events, discounts, and hours, you can call (831-423-5590) or visit their website. 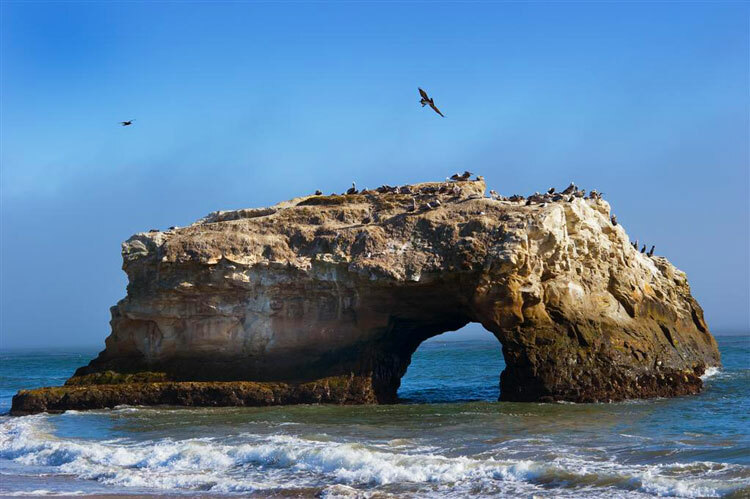 Don’t miss the wildlife viewing at Natural Bridges State Beach – a beautiful place to stroll. Whales, seals, and sea otters are frequently seen playing offshore. Come at low tide to see starfish, crabs, and anemones in the tide pools. And from October–January, the eucalyptus trees north of the beach are filled with thousands of monarch butterflies resting their majestic wings for the winter before they begin their great cross-country spring migration. Bird-watchers often find unusual warblers in these trees as well. The free, short-term parking lot is a great place to spy on cormorants and guillemots on the rocks belowFor more information, you can call 831-423-4609, or visit the California State Parks website. Come walk with giants at the Henry Cowell Redwoods State Park. You’ll find old-growth redwoods up to 265 feet tall and 1,800 years old, 20 miles of trails, a nature center, and bookstore. Just head up Hwy 9 from Santa Cruz. You can visit the giant redwood trees via the standard-gauge Beach Train, which travels through Henry Cowell Redwoods State Park to Roaring Camp, then down the scenic San Lorenzo River Gorge, across a 101-yr old bridge, through an 1875 tunnel and back to Santa Cruz, during a three-hour roundtrip. Another railway choice is the authentic 1890 narrow-gauge Steam Train, departing from Roaring Camp through redwood groves and over trestles to the summit of Bear Mountain while conductors narrate the history of the railway, forest, and Roaring Camp. It’s a 1-1/4 hr roundtrip, and for more information, you can call (831-335-4484) or you can check their website for all the schedules. Ever get the “leans” when you’re flying in IMC? You’re convinced you’re turning, but the artificial horizon says no. It takes discipline to ignore the sensations from your body and focus on the instruments. So for a little fun, every pilot visiting Santa Cruz should try the Mystery Spot once. Did aliens leave mysterious magnets underground? Is it some unexplainable geographic vortex? Balls roll uphill, short people become tall, and you can even walk on walls. You will be undeniably perplexed. Wear comfortable shoes; you can hike in the surrounding redwood forest before or after your 45-minute tour. The Mystery Spot is open daily 9 AM – 7 PM between Memorial and Labor Day weekends, otherwise, it’s open Monday through Friday, 10 AM – 4 PM, weekends till 5 PM. Tickets are available online at the website for 6$, parking is $5, and children 3 and under are free. You can also call them at 831-423-8897. Two newly renovated Santa Cruz beach hotels merit a lot of attention. Within easy walking distance of the Boardwalk, pier, restaurants, and two parks for outdoor exercise. The Sea & Sand Inn only has 22 rooms on the cliffs overlooking the beach, but the grounds are spacious and meticulously maintained. Again, every room has an ocean view, though 206–208 are best. You can get an in-room Jacuzzi or fireplace, and there’s a free continental breakfast, refreshments on summer afternoons, and free wireless internet. For more information, you can call (831-427-3400) or visit their website. The Dream Inn pays homage to 60s chic, with lime green, yellow, and orange themed rooms, all filled with mod furniture. All 165 guestrooms feature ocean views and private balconies or patios so that you can step right out onto the sand or watch the sun rise from your room. Dream Inn also offers a pool, Jacuzzi, a kid’s wading pool, free weekend yoga classes on the deck, free parking and wireless internet. For more information, you can call (866-774-7735 or 831-426-4330) or check their website. Aquarius, the restaurant adjacent to the Dream Inn, has beach views and American cuisine featuring sustainably caught seafood as well as terrestrial fare, such as steak and pork chops. A local favorite, the Roasted Halibut is accompanied by mussels, chorizo, organic potatoes, and a Pernod-tomato broth, and the Potato-crusted Dorado features a chilled beet & carrot salad, baby tatsoi, and beurre blanc. For brunch, you can enjoy waffles, pancakes, French toast, oatmeal, and outstanding huevos rancheros, or choose from a variety of seafood or chicken salads, fish and chips, shrimp tacos, or burgers, including a juicy portabello mushroom for vegetarians. For more information, you can call (831-460-5012) or visit their website. Satisfy your desires for fresh seafood, adventure, and family fun by flying to Monterey. 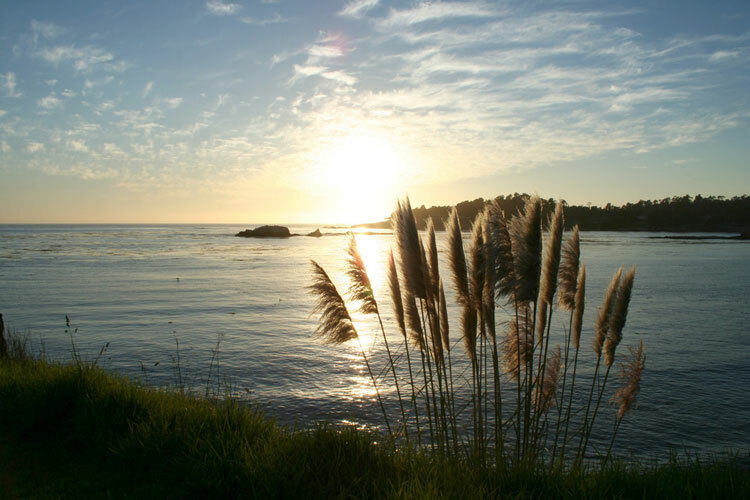 While a day spent lounging on the rocks watching the waves would be an adventure on its own, why not visit the Monterey Bay Aquarium to gain an appreciation for diverse ecosystem hidden just offshore, or go kayaking and play peekaboo with the otters, or catch an adrenaline-fueled ride at the Santa Cruz Boardwalk? Scenic Monterey is your gateway to a perfect summer. Crista V. Worthy is Managing Editor of Pilot Getaways magazine, a travel magazine for private pilots, and Editor of The Flyline, the monthly publication of the Idaho Aviation Association. She also writes occasionally for several other aviation publications, including AOPA Pilot. A native Californian, Crista has been flying since 1995, is a fan of both backcountry flying and hiking, and now lives in Idaho with her husband Fred.